American persimmons are as their name suggests, native to North America. The small fruits are most often orange but can be golden yellow to red in color. Unripe fruits are hard and contain high levels of tannins and produce a very astringent taste. Ripe fruits are one to 2 inches in diameter and are very soft, the sugars fully developed resulting in a sweet flesh. American persimmons are available in the fall and winter months. American persimmons are botanically known as Diospyros virginiana, with a hint of their country of origin embedded in the species name. American persimmon trees are semi-wild and are often used as “edible landscaping” for both fruit and appearance as well as an attractor for wildlife, like deer and birds. 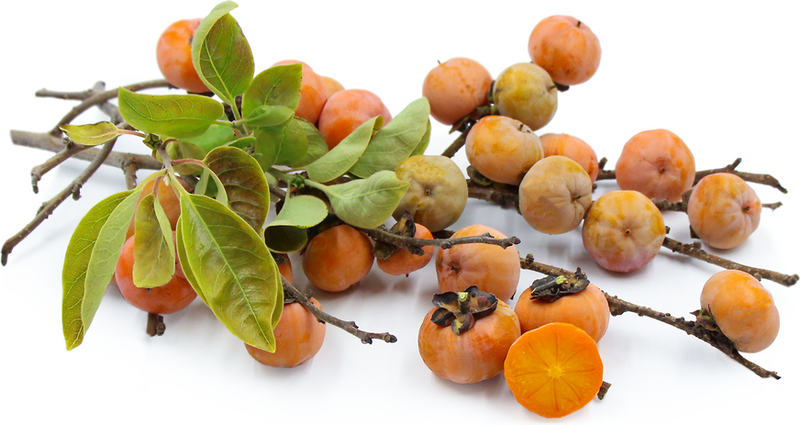 Commercially, the Asian persimmon varieties are more well-known in the United States though some efforts are being made in Indiana to commercialize the American variety. It is known in the south as simmon, possumwood, and Florida persimmon. American persimmons are high in tannins and low in both protein and fat. American persimmons are most often eaten fresh, when ripe or used in recipes for candies, baked goods and beverages. Dried American persimmons can be used in baked goods and have also been fermented with hops and whole grains to make a kind of beer. To store, refrigerate unripe fruit until ready for use. Once ripe, American persimmons are quite perishable. A permanent ink can be made from the flesh of the American persimmon. The American persimmon tree is native to Kentucky and has a growing range that spans the Mississippi river basin and much of the Midwest and Southeastern United States and can grow as far north as Connecticut. The tree thrives in areas of isolation and low water supply. The cultivation of American persimmons was a task undertaken by a name named Jim Claypool, of St. Elmo, Illinois. He is cited with being the first to try to improve various growing characteristics in order to make the variety easier to grow and more marketable. It was believed that persimmons require a frost in order to develop its sweet taste and soft texture. Persimmons merely require more ripening time on the tree; most fruits will fall from the tree when ripe. One set-back to the commercialization of the American persimmon is the fact that the fruits must be harvested by hand due to their fragility and potential for bruising. Generally available through specialty tree sellers, American persimmon trees are hardy in USDA zones 5-9. Recipes that include American Persimmons. One is easiest, three is harder. Someone shared American Persimmons using the Specialty Produce app for iPhone and Android. Sharer's comments : Amercian Persimmons spotted at The Real Atlantic Superstore fredericton.